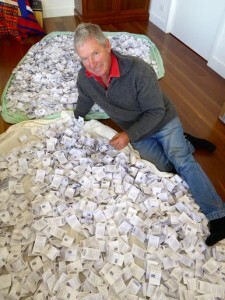 Tom Silcock with DNA sample cards for the Merino Lifetime Productivity Project. AUSTRALIAN Wool Innovation and Meat & Livestock Australia have been accused of indulging in “schoolyard bickering” over the processing and IP ownership of data from the Merino Lifetime Productivity Project. 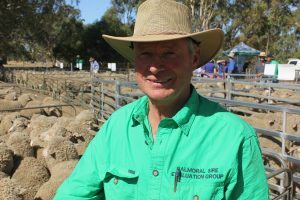 At his final The Mountain Dam Merino ram sale near Balmoral on Monday, former Australian Merino Sire Evaluation Association chairman Tom Silcock criticised both bodies for holding the wool industry and MLP breeders “to ransom”. Over about 2.5 years, AWI and MLA have failed to reach agreement on allowing data from the $12 million 10-year national Merino Lifetime Productivity Project into Australia’s national breeding evaluation service, Sheep Genetics, and into MERINOSELECT, which genetically ranks sheep with Australian Sheep Breeding Values (ASBVs). Following Mr Silcock’s comments this week, MLA and AWI comments indicate the two bodies are still in disagreement over the issues of Sheep Genetics operations and service delivery. AWI ceded control of the MERINOSELECT database and data analysis software called Ovis when it withdrew from Sheep Genetics in 2016, leaving MLA as the sole funder. However, Ovis is needed to process data to generate genomic analysis for the Merino Lifetime Productivity Project, which is managed by AWI in partnership with the Australian Merino Sire Evaluation Association and breeders. Negotiations between AWI and MLA have centred on the IP ownership of genomic analysis created by Ovis from Merino Lifetime Productivity Project data, its availability to industry and its incorporation into MERINOSELECT for improvement and development of ASBVs. “Ovis creates a genomic analysis, which was initially regarded by the Sheep CRC as an IP product. “It’s not about using Ovis, but if you use it you sign away your claim to the genomic IP,” Mr Silcock said. Former Balmoral Sire Evaluation Group chairman Tom Silcock. “Their actions are stopping the competition for DNA pedigree — commercial competition. “And so they are holding the industry to ransom, because that competition will obviously reduce pricing and increase adoption and all of that stuff would then be going into the national body and data bank of the Information Nucleus Flock,” he said. Mr Silcock all the MLP sites across Australia have collected blood cards or tissue samples for DNA pedigree analysis. “All of those cards and samples are being sent to have a genomic analysis done on them – every animal bred in MLP. Mr Silcock said “a couple of individuals are holding the whole industry to ransom.” The Merino breeder said he has been told negotiations were close to being finalised. “They are, but how long have I got to be told they are close? “It’s just ridiculous,” he said. “At the moment, my understanding is that there is agreement to a deal that went from AWI. Mr Silcock believed an agreement from AWI has been with MLA for “months”. MLA’s general manager, producer consultation and adoption, Michael Crowley. However, MLA’s general manager, producer consultation and adoption, Michael Crowley, said any claim that AWI has signed an agreement that has been sent to MLA, and that MLA is holding the process up, is factually incorrect. “MLA has been proactively engaging with AWI on an ongoing basis to negotiate terms for the inclusion of MLP data into Sheep Genetics, and more specifically MERINOSELECT. “AWI does not fund operational and service delivery components of Sheep Genetics, but they have been trying to use the negotiations over MLP data to influence the operation and service delivery of Sheep Genetics,” he said. “MLA has been prompt and reasonable in the MLP negotiations. “We’ve agreed to the key principles that AWI would have a research license to utilise OVIS (the analytical software engine) for R&D purposes and AWI would contribute MLP data to Sheep Genetics under a separate agreement,” Mr Crowley said. “But we won’t allow AWI to influence the Sheep Genetics program, which they don’t fund, because that is not in the interests of the producers the program serves. “MLA remains committed to investing in the sheep genetics program and has carried the full investment in this program since 2016,” he said. A statement from AWI said the research, development and marketing company is proactively and collaboratively working with MLA to reach agreement for MLP data to be used by Sheep Genetics. “AWI justifiably requested a standard of operations and service delivery from Sheep Genetics that ensures it delivers to wool growers appropriate reporting quality, frequency and transparency from its analysis of the $12M wool industry and government investment in generating the MLP project data. “AWI has been timely and reasonable in its negotiations and are confident an agreement will be reached,” the statement said. At the ram sale, Mr Silcock also congratulated the Victorian Government for their leadership and courage for making electronic identification for sheep mandatory and called for the removal of restrictive legislation on virtual fencing. He said laws preventing research into virtual fencing were recently relaxed in Victoria. Mr Silcock called for commercialisation of walk-over-weighing technology for sheep, which was successfully trialled with the MLP Project six years ago. AWI stopped funding the CRC Genomics Flock in 2012, so wool traits have not been measured since then. MLA continued to fund measurement of meat traits. AWI stopped funding Sheep Genetics in 2016, while MLA continued to fund SG and ASBVs. AWI now need both genomics and SG to process thousands of data from the multi-million dollar MLP project, but on AWI’s terms. 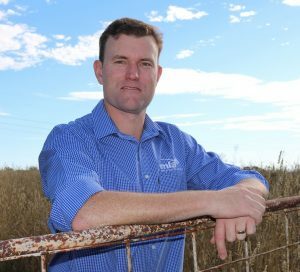 AWI’s disruption and lack of collaboration is costing growers big time. The EY review covers these issues and must be adopted in full.